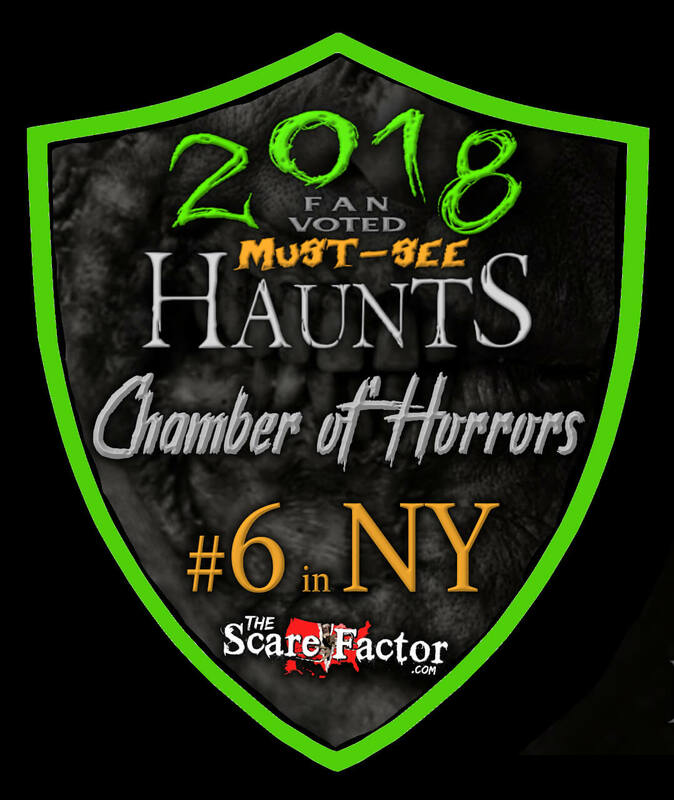 Team Crypt Creepers reviewed this attraction on October 20, 2017. Get ready to enter a trilogy of terror in this three-part haunt. 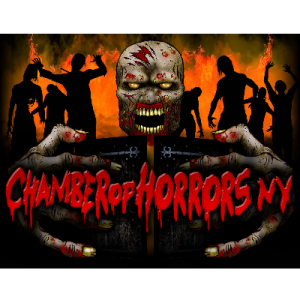 Split into three separate themes, Chamber of Horrors goes for 3 very different types of things that go bump in the night to scare its guests. Don’t be fooled by its party vibe set up by the 2 DJ’s and color-changing turntable station, there are creeps inside ready to slice up their new prey and turn you into just another prop. This indoor baseball and activity center transforms into a twisting, twisted path of chaos, where you venture forth into a manor with dark secrets, a darkened maze, and the home of some very ruthless killers. So step up to the plate, because this haunt is gonna send you running home. The cast here is very solemn in their scares, trading out high energy for foreboding scares. The scaractors glare at you as you walk by (usually from behind masks, waiting for their chance to strike. Most of the scares were silent ones from the scaractors, so not much dialogue is used. In its place though is use of surroundings, such as drop portraits or using set layout as a distraction. The scaractors stayed in character until guests left, usually following or at least staring at, guests as they left the room. The twins from The Shining made an appearance, and did an eerily great job. Three different themes mean three different types of characters, all with their own unique costuming. The costumes in Maniac Manor were great, all very formal suits and dresses with a form of animal mask. It felt like something straight out of a horror movie, where a small group gets kidnapped and brought to the home of some eclectic rich people who are looking for a new type of prey to hunt. The killers in Slaughter House definitely looked the part, covered in blood and wielding chainsaws. Each theme was distinct, and the costumes made sure you could tell where one ended and the next began. The queue entertainment here is very different than any other we have come across so far on our end. The outdoor queue has a DJ spinning today’s latest hits, and inside has a skeleton puppet DJ-ing not only other hits, but interacting with guests. Between random banter and playing “Name That Tune” with guests, he kept things entertaining during the wait. Some local indie horror film trailers also played on a TV screen and a roaming ghoul with a taste for blood would slit his tongue for guests. Parking can be a little troublesome here, since they have a limited parking lot, and the attendant told us there was more parking down the road, and down the road was a highway. Besides the giant monster face, the outside seems more like a party than a haunt. The outside doesn’t do much to prepare guests for what is inside. The indoor queue does a slightly better job, with its dim lights and horror trailers, but again the DJ makes it feel a bit more like a party, which is interesting. The sound effects matched up with the scenes that they were used in, and sounded good. There were a number of fun effects, ranging from endless hallways/shafts, to a flesh room that looked great. Maniac Manor was very detailed, portraying a sense of richness, while Slaughter House uneased guests as they walked through with its photos of victims lining the walls. The lighting was a bit dim at times, making it difficult to see the scaractors makeup. This haunt is broken into three themes: Maniac Manor, 3 2 1 Blackout!, and Slaughter House. The first stands out above the other two with detailed sets, great costumes, and some fun wall-mounted animatronics. 3 2 1 Blackout! Started as a dark maze and had some optical illusions and movie character appearances, but didn’t stand out much. Slaughter House played up the creep factor with its grotesque kills, such as the meat grinder. Each theme was separated and did not blend into the next. 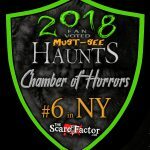 Though not the scariest haunt, there is eeriness at Chamber of Horrors. Creatures glare at guests as they walk by, and some fun effects make for some good distractions as scaractors get into positions. For the most part, the scares are unpredictable, except when the scaractor who lurks just in front of you waiting for their time to strike. The ending was creative and the first time we saw anything like it. It was not anything super scary but it was different. I won’t ruin what it was here, you’ll have to see for yourself. The total walkthrough for this haunt was about 20 minutes. Tickets cost $30, or you could get a fastpass for $40 online ($45 at door) which gets you past the line and entrance to its three-minute escape room.